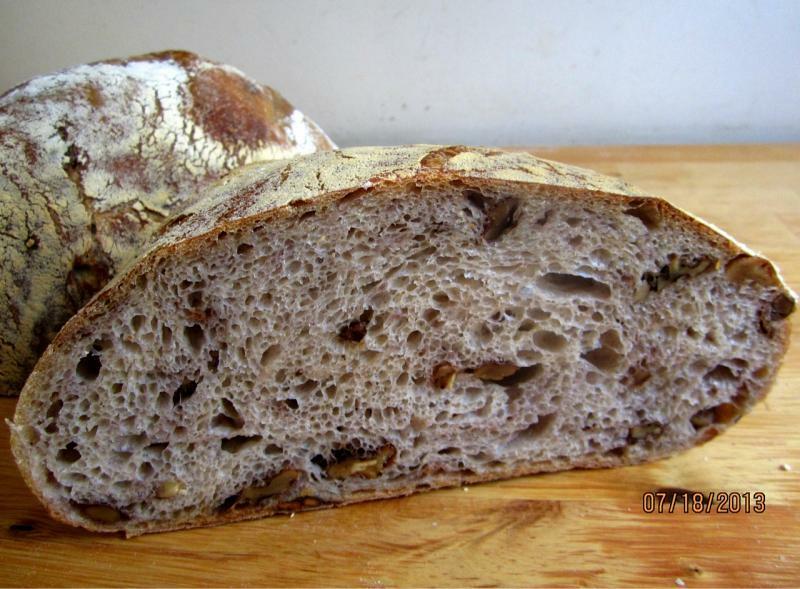 Einkorn Hazelnut Levain - Pinched Not Kneaded! 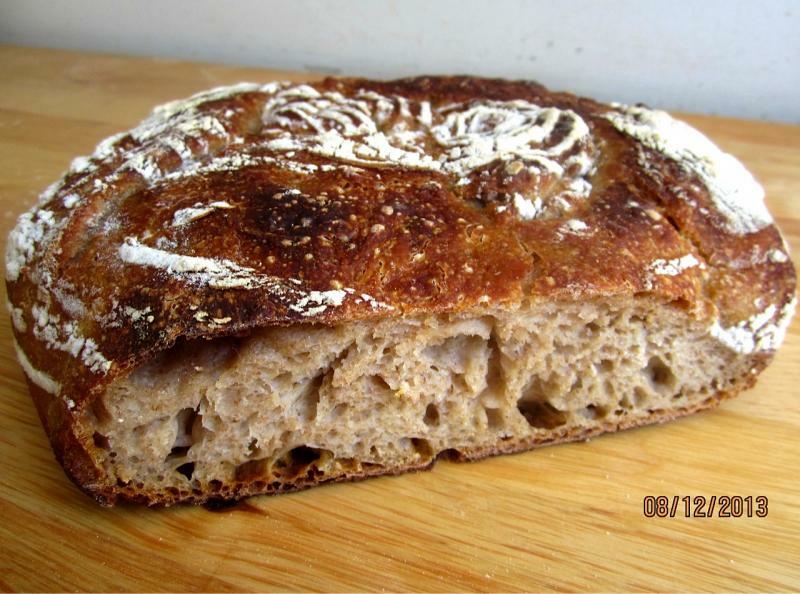 Home > Einkorn Hazelnut Levain - Pinched Not Kneaded! A while ago I needed to add another book from my Amazon wish list to qualify for free shipping. More or less randomly, I picked Ken Forkish's: "Flour, Water, Salt, Yeast"  - the price was right! When I started leafing through the book, I was intrigued by his approach to kneading - or, better, not kneading the dough. From Dan Lepard's Pumpkin Whey Bread  I knew that very brief kneading (30 seconds), followed by some folds, can be sufficient to process some doughs - but pinching? Usually I don't mix my doughs by hand (my skin is very dry) so I used a large wooden spoon for stirring flour and water together. But Forkish is right, using your hands is much faster, and you have less cleanup afterwards. 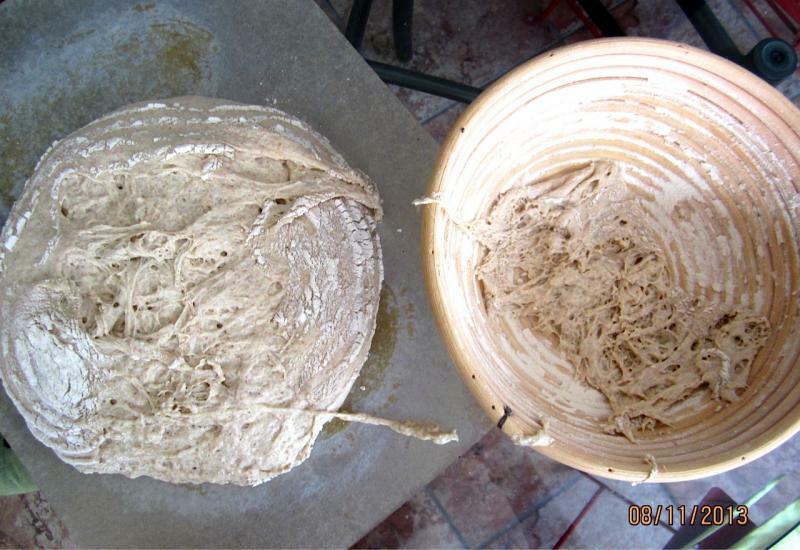 During the pinching and folding process, the dough behaved exactly as it should: rising, then leveling out after each fold, calling for the next round. And getting more elastic and smoother after each turn! Forkish's descriptions are precise, and detailed, but, nevertheless, there were stumbling blocks on the way, and it took more than one trial to finally master the whole process. Why the waste? You are supposed to build a huge amount of levain, only to use a small percentage of it for your final dough - the rest goes in the trash. Sure, flour and water don't cost much, but this is definitely not my idea of frugality and environmental consciousness! The rationale behind this waste? Beats me. The breads taste great, even when made without all this splurging. Does a loaf, made with just as much levain as needed, taste any different from one where the starter came out of a big bucket? Hard to believe! 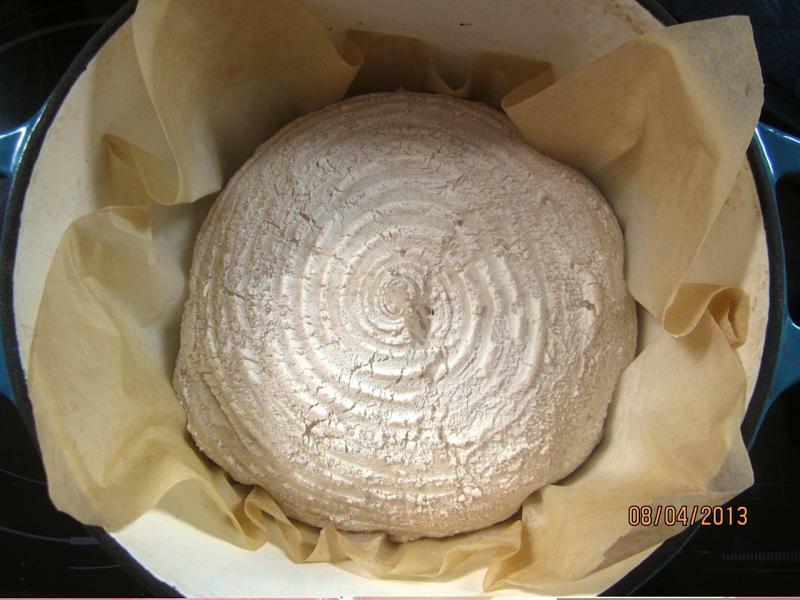 Don't think you can ease the proofed bread with your usual gentle coaxing from the basket. Forget your good manners - your dough needs slapping! After the sticky wicket of breads that stubbornly clung, and then deflated in the extraction process, I finally checked YouTube. And there it was: I saw master baker Forkish slamming the banneton with gusto on the counter - brutal force did the trick! After this eye-opener I was less timid, and the breads finally let go. Soft skin vs. hot pot. Not afraid of third degree burns, Ken Forkish places the bread smoothly into the Dutch oven. Others, with less experience, might not be so lucky. But there is an easy way out: the paper sling! This worked well for other DO breads I baked, like Aroma Bread . Therefore, save your skin - use parchment for a painless transfer. Once these snafus were overcome, every bread I made from "Flour, Water, Salt, Yeast", plus my "à la Forkish" variations, turned out great. "Bold baked" crust, holey crumb, and extraordinary taste - my random pick to fill my shopping cart at Amazon became one of my favorite baking books! A&B Naturals, my favorite food store (they sell my breads!) just started carrying Einkorn flour, and I love hazelnuts. 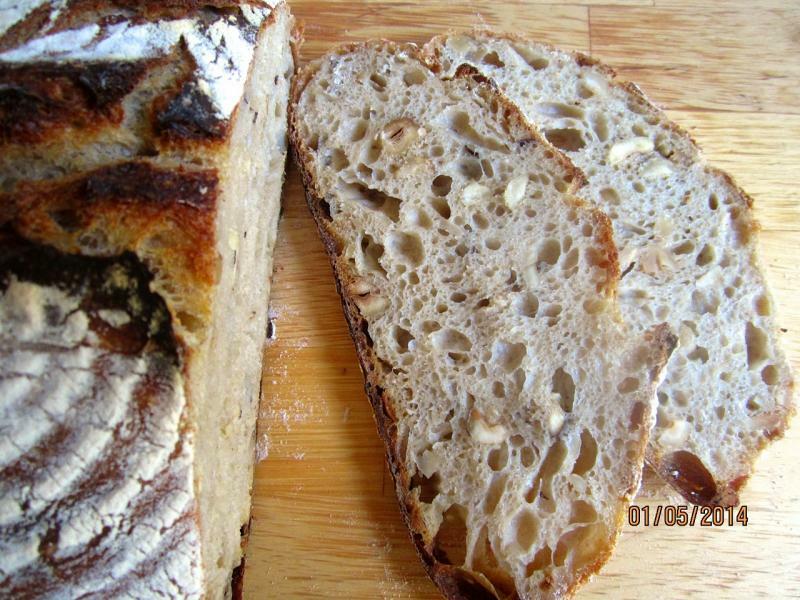 Combining both in a loaf à la Forkish, this is the bread I came up with: EINKORN HAZELNUT LEVAIN : Here  you can find my formula and description to make this tasty bread - pinching instead of kneading!